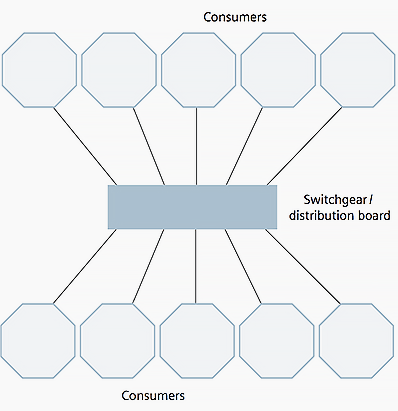 Low voltage switchgear and distribution boards form the link between the equipment for the generation (generators), transmission (cables, overhead lines) and transformation (transformers) of electrical energy on the one hand and the consumers, e.g. motors, solenoid valves, devices for heating, lighting, air conditioning, and the information technology on the other hand. For alternating voltage, the rated voltage is 1,000 V max., for direct voltage it is 1,500 V max. NOTE // In the IEC/VDE standards, the term “power switchgear and controlgear, PSC assembly” is used. Like medium voltage switchgear, low voltage switchgear is also less often installed with individual panel design on site, but delivered as factory assembled, type-tested switchgear. For design verification, testing is to be accomplished successfully in compliance with IEC 61439-1 (VDE 0660-600-1) and IEC 61439-2 (VDE 0660-600-2). Test verification under arcing fault conditions in accordance with IEC / TR 61641 (VDE 0660-500, Addendum 2) ensures maximum safety of persons. Protective measures such as high-quality insulation of live parts (for example busbars), uniform and easy handling, integrated operator fault protection, and reliable switchgear dimensioning prevent arcing faults and hence personal injuries. 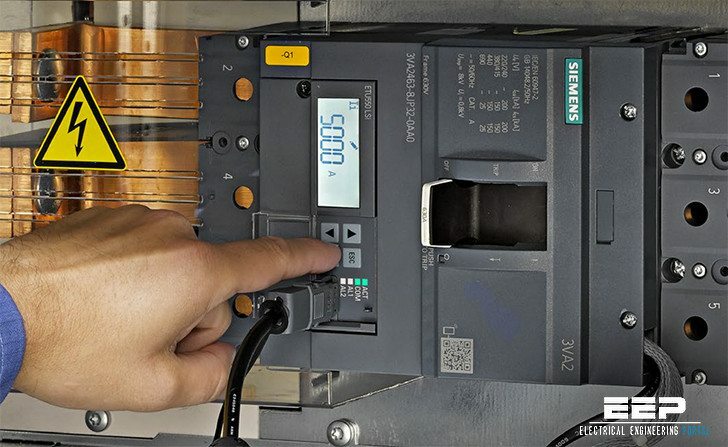 The main components of the switchgear are: busbars, switching devices, secondary structures, protective equipment, measuring and counting instruments. Depending on the type of power distribution, a differentiation is made between point-to-point distribution boards and line distribution boards. In point-to-point distribution boards, the electric power is distributed radially from a spatially limited system (see Figure 1). Whereas in line distribution boards – today mostly busbar trunking systems – the individual power tappings take place via spatially separated equipment and the power is transmitted to these tap-off units by means of encapsulated busbars (see Figure 2). In point-to-point distribution boards, one transformer per busbar section supplies the main switchgear. The downstream motor distributors, control units, distributors for lighting, heating, air conditioning, workshops, etc. – that is, those fed by the main switchgear in turn – are referred to as sub-distribution boards. The combination of a main switchgear with feed-in transformer is referred to as transformer load centre substation. Due to its compactness it provides a secure and economic option of distributed power supply in compliance with the factory-assembled stations described in IEC 62271-202 (VDE 0671-202). Left: Simple and safe operation of the withdrawable units behind closed doors; Right: The mechanical coding of the withdrawable unit prevents any confusion of withdrawable units of the same size. When planning low voltage switchgear, the prerequisite for efficient dimensioning is the knowledge of the local conditions, the switching duty, and the demands on availability. For power distribution systems in functional buildings, no large switching frequencies have to be considered and no major extensions are to be expected. Therefore, performance-optimised technology with high component density can be used. In these cases, mainly fuse-protected equipment in fixed-mounted design is used. In a power distribution system or motor control centre for a production plant, however, replaceability and reliability of supply are the most important criteria in order to keep downtimes as short as possible. A vital basis here is deploying withdrawable unit systems both in circuit breaker protected and in fuse protected design. A multi-purpose low voltage switchgear installation is characterized by numerous combination possibilities of different mounting designs within one panel and variable forms of internal separation. The forms described in IEC 61439-2 (VDE 0660-600-2) are listed in Table below.